For those who want the ultimate in contact, the Anaconda might be the perfect mate. As described by Paul Sarone, the most noticeable character in the film, "It strikes, wraps around you, holds you tighter than your true love and you get the privilege of hearing your bones break before the power of their embrace causes your veins to explode. Then it swallows you whole." Who could ask for anything more? (Of course, there's always the extra added attraction when it spits your bones out in orgasmic splendor.) 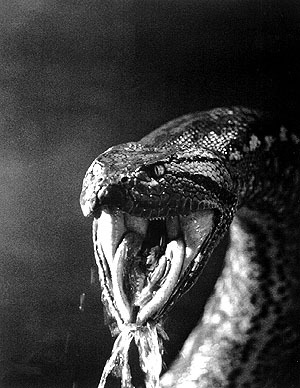 So, why hasn't anyone made a memorable film about a giant snake before? We've had every other creature under the sun doing terrible things to the unsuspecting, so why forget the original nasty made-to-eat-dust pre-biblical serpent? Perhaps there weren't sufficient CGI's or animatronics available in the Hollywood Garden of Eden previously. Director Luis Llosa, a man who has already made two films before this in the Amazon and will undoubtedly make many more there, has taken on the task. Copyright © 1997 Columbia Pictures Industries, Inc. All rights reserved. A documentary film crew under the direction of Terri Flores (Jennifer Lopez) which includes her anthropologist boyfriend, Steven Cale (Eric Stolz), heads down the Amazon river without the slightest inkling of what lies ahead. Underway, they are unlucky enough to meet up with the seedy Paul Sarone (Jon Voight) who has aspirations toward catching the legendary 40-foot Anaconda that the Shirishama Indians have told tales about since time untold. Sarone's knowledge of this specific tribe, which is the topic of the documentary, is enticing enough to the crew to make them put up with almost anything he does. Sarone, needless to say, is not a nice man. With intentions to sabotage the journey and sacrifice their goal to his own needs, he dynamites a dam and suddenly, whoosh, its raining snakes. One breathes relief at the introduction of something more interesting than the boring tensions and forced arguments between the characters on board. Bopping among the rest of the cast is Ice Cube, known from Hip Hop and no stranger to the silver screen since his debut in Boyz-N-The-Hood. Cast member Kari Wuhrer, who plays production manager Denise Kalberg, shares a private insight by revealing "There is a subtle message in this film. It says that we're down here in the Amazon messing around with what is the most awesome, incredible power on the planet: the Amazon Jungle." More astonishing than anything offered in the film is the fact that Kari found a message somewhere and that she found it subtle. The beginning of the film has all the atmosphere of a "B" movie from the 50's, albeit in color, but it slowly progresses to have all the charm of a "B" movie from the 60's, albeit with FX from the 90's. In other words, the real star of the film is the snake. The two animatronic versions, one 25 feet and one 40 feet, built for the film were 1500 pounds and a ton respectively. Once the second model was animated by the computer it had a torque of 10 tons. Voight does his best to set down a villain to remember, but the script does its best to hold him back. Stolz's presence adds extra credibility, but his extended illness on board the boat (including offscreen recuperation) almost make it look as if he didn't have to be on location for most of the shoot and thereby managed to save production expenses for the financers. Lopez is attractive, performs her role well, and fulfills the qualities her part demands. The Amazon Queen meets The Lost World? Not quite.